Had a long day? Then you definitely deserve a treat! 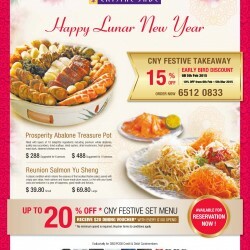 Head down to Crystal Jade Prestige for dinner and we'll slash 20% off your total bill (a la carte items only). So what are you waiting for? Use the promo code to reserve a table at Chope.co right now! 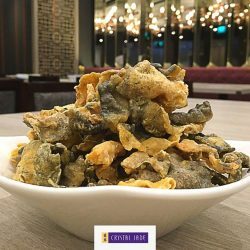 To celebrate the opening of our newest Crystal Jade Kitchen outlet in The Centrepoint, present this post and the first 30 fans per day get a complimentary Salted Egg Yolk Deep-fried Fish Skin with a min. spend of $20! 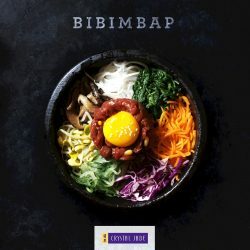 What goes in your bowl of Bibimbap? Go ahead and dig into this healthy sizzling bowl at Crystal Jade Korean Ginseng Chicken & BBQ today. The best part? Order this and get 50% off your second main dish. Crystal Jade Prestige has launched a new menu featuring new signature dishes and Crystal Jade Golden Palace Michelin One Star dishes. Go for an early lunch from 11.15am - 12.30pm and enjoy 15% off your total bill. Make a reservation now: http://bit.ly/2brwKyd. 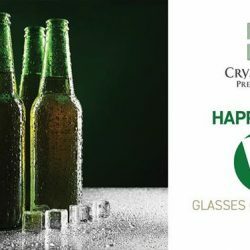 Enjoy 5 glasses of Draught Beer for only $20* from 6-8pm or avail of our buy-2-get-1-free promotion of House Wines for only $150 at Crystal Jade Prestige. It's time to head over there after work to unwind and enjoy the night with friends. Cheers! 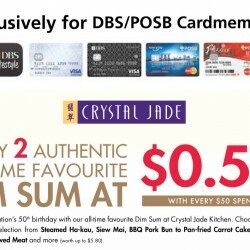 Calling all DBS/POSB Cardmembers, celebrate Crystal Jade's 25th Anniversary! 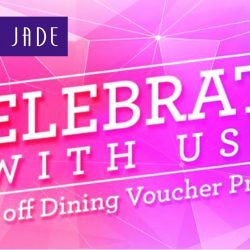 Enjoy 25% off $50 Dining Voucher exclusively for Jadeite members with payment with DBS/POSB Credit or Debit Card. While stocks last. Shop online now before it runs out! Not a Jadeite member yet? Simply sign up for free now to start shopping! 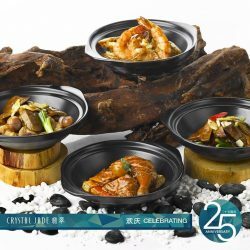 Enjoy 25% off from a wide selection of claypot dishes at Crystal Jade Dining IN from July to September 2016! No matter if you're craving for our signature Braised Beef Cube with Kailan or your mouth waters at the thought of our Stewed Cod Fish with Wild Mushroom Sauce, we got 8 delicious choices just for you. Hang in there! We're halfway through the work week! Meanwhile, Jadeite members get to enjoy 50% off second item when they order any a la carte item at Crystal Jade Korean Ginseng Chicken & BBQ. Offer is valid from Monday to Friday lunch and ends on 30 September 2016. Fried rice never fails to brighten up our day, agree? Here's one more reason to keep on smiling. 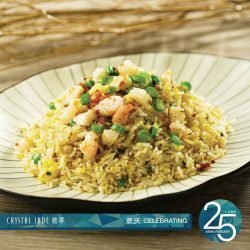 Enjoy 25% off our new dishes at Crystal Jade Kitchen from today until end of September. In addition to the Seafood Fried Rice with Shrimp Paste, be sure to try our Vermicelli with Shredded Chicken and Fungus Thick Soup, Deep-Fried Soft Shell Crab with Salad Sauce and more! Love it cheesy? 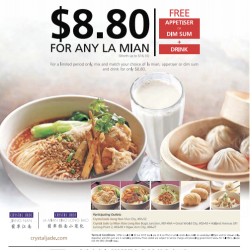 Then you just have to try Crystal Jade's new Cheese Mushroom Xiao Long Bao at its introductory price of $6.80*! 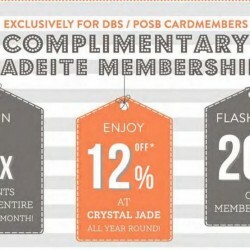 Exclusive promo price for Jadeite members and DBS/POSB Cardmembers. Tag your friend whom you know will love this new treat! Hurry, promo ends on 30 June 2016! 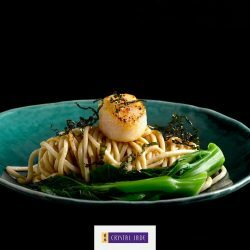 If Crystal Jade is one of your favourite restaurants, sign up for their newly launched Jadeite membership now! It is complimentary for DBS/POSB Cardmembers and you can save when you dine at Crystal Jade, join cooking classes, wine tasting events, food tasting ambassadors and even events like food photography! Also get great special discounts, 20% off birthday month and more! 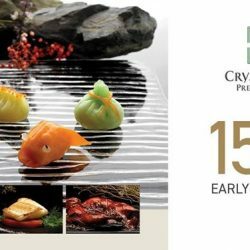 Exclusively for DBS/POSB Cardmembers, enjoy 50% off a selected dish with minimum spend of $50 at Crystal Jade Kitchen from now till 30 November 2015. Select their wide selection of sumptuous and tantalizing dishes that will tickle your taste buds. It's October! The year has passed by so fast. 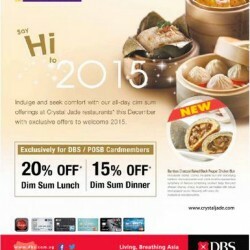 Enjoy this new promotion exclusively for DBS/POSB Cardmembers at Crystal Jade. Embark on a culinary journey into the rich traditions of Jiangnan cuisine at and get a selected complimentary dish when you spent a minimum of $40 and above from Oct to Nov 2015. Enjoy the skilfully crafted snacks and delicacies like Pan-fried Shanghai Pork Bun, Szechuan Dan Dan La Mian, Ma Po Beancurd and more! If you love dim sum, steamboat or BBQ, head down to Crystal Jade's chain of restaurants now! 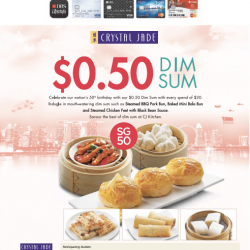 For DBS/POSB cardmembers only, in celebration of SG50, Crystal Jade is having a special promotion at each of its restaurants! Head down to Crystal Jade Kitchen for their authentic all time favourite dim sum! Choose from their wide array of selection from Steamed Ha-kau, Siew Mai, BBQ Pork Bun to Pan-fried Carrot Cake with Dried Shrimp & Preserved Meat and more (worth up to $5.80). Every year I look forward to the Mid-Autumn Festival as various hotels and restaurant chains promote their mooncakes, and this is the time which I extremely worry about my weight. 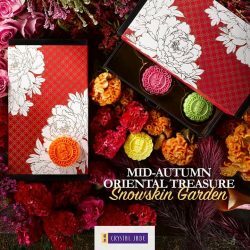 My diet plan is under even more disruptions when the mooncakes are having discounts, such as the one by Crystal Jade. 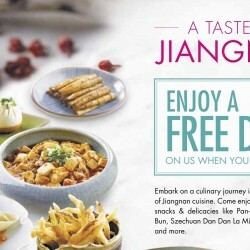 They are giving 25% discount to DBS and POSB card members for Online Purchase for the Mid-Autumn Heavenly Indulgence. I am definitely not going to miss this promotion. Celebrate our nation’s 50th birthday with our $0.05 Dim Sum with every spend of $30. 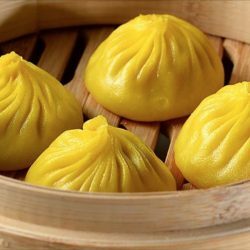 Indugle in mouth-watering dim sum such as Steamed BBQ Pork Bun, Baked Mini Bolo Bun and Steamed chicken feet with black bean sauce. Savour the best of dim sum at CJ kitchen. Hurry! Enjoy and Speaking of good dining deals, how does a main course, dimsum and drink sound for lunch? 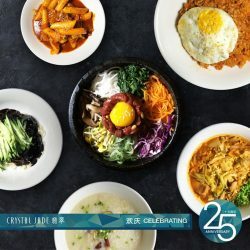 Exclusively for DBS/POSB Credit and Debit Cardmembers, enjoy super value $9.80* lunch sets at Crystal Jade Kitchen (#04-42)! hurry grab now! 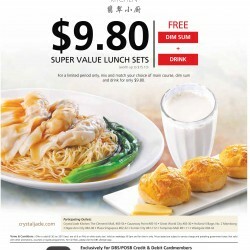 Enjoy the super value lunch sets at $9.80 (worth up to $15.10) @ Crystal Jade and with free dim sum plus drink. For limited period only. 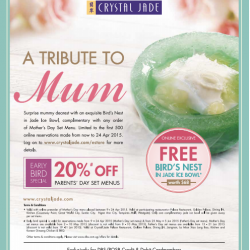 Free birds's nest + 20% off parents' set menus @ Crystal Jade.Online exclusive free bird’s nest in jade ice bowl* worth $68. 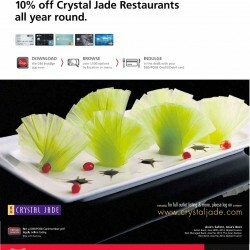 DBS/POSB Cards exclusive: 10% OFF @ Crystal Jade Restaurants all year round. Say Hi to 2015! Indulge and seek comfort with all-day dim sum offerings at Crystal Jade restaurants this December with exclusive offers to welcome 2015.